The poor in Nepal appear to possess the Midas touch. Wherever the government has handed over control of degraded forestland to them under the leasehold forestry programme, the Himalayan country's ecology has staged a magical turnaround. In the process, the below poverty line (bpl) households have unfolded economic miracles also. Untouched by development projects for years and stripped of life-sustaining resources such as forest and land, suffering hardship had been a way of life for Nepal's poorest who reside in the hills. So when the authorities started leasing out decaying tracts of forest to bpl families, the latter seized the opportunity. A movement that took root in two districts in 1993 has today sprouted in over 10 districts, with more than 11,000 households involved in managing forests. The phenomenal success of the scheme recently prompted the Nepal government to declare it a priority poverty alleviation programme and extend it to 16 more districts. In terms of its benefits percolating down to the grassroots, leasehold forestry has surpassed all other developmental programmes (see flow chart: New lease of life), including the highly acclaimed community forestry management (cfm) project. "It has resuscitated the environment in the hills and economic gains have followed," says D D Bhatta, the director general of Nepal's forest department (fd). The genesis The concept of leasehold forestry first cropped up along with cfm in 1988 in Nepal's master plan for its forestry sector. Initial plans, however, envisaged making industry the beneficiary. With the International Fund for Agricultural Development pledging financial aid, the clause on leasing out forestland to bpl households was included in the Forest Act of 1993. Under the leasehold plan, blocks of degraded forest are leased out to below poverty line families for 40 years. To date, 7011 hectares (ha) of decaying forestland has been given to 1655 groups comprising 11,253 families in 10 districts. Raising the incomes of bpl families in the hills and improving the region's ecological condition are the twin objectives of this project. The government's groundwork involves identifying a patch of degraded forest and selecting a group of poor households with an annual income under us $32.50 (Nepali Rs 2,500). An operational plan is then chalked out for five years. Once the chosen families make a consensual decision on the forest regeneration methods and the nature of ancillary activities to supplement their income, the tract is leased out. The fd is the nodal monitoring agency for the programme, but the departments of agriculture and animal husbandry assist the group in implementing related tasks. Ironically, the success of the cfm programme has also highlighted its inadequacies. Firstly, since its aim was to ensure proper maintenance of all types of forestland in order to halt degradation, the beneficiaries were free to choose the tracts they had to conserve. They opted for the dense stretches and, consequently, only five per cent of the total forest under cfm is degraded. The implementation of leasehold forestry was thus necessitated to stem the rot in the already decaying and currently neglected woodland. Another shortcoming of the cfm was that it bypassed the lowest strata of society by not classifying the users on a socio-economic basis. Often it was found that the poorest people could neither participate in the decision-making process nor enjoy the fruits of labour. The leasehold scheme addressed this lacuna by taking into consideration the welfare of only bpl households. "We are not only protecting and regenerating all of our forests but also reaching the benefits to each and every section of society," says K B Sreshtha, the deputy director general of forests and in charge of community forestry. The Chitripani region of Makwanpur district has undergone a dramatic environmental face-lift in the past few years. The lush green makeover of the hilly area coincides with an upswing in the financial fortunes of those behind the effort. Significantly, Chitripani is among the first places where the leasehold forestry experiment has been conducted. The area's plant species diversity has increased from 37 varieties in 1994 to 58 in 2000. In Bhagawatisthan, located in Kavre district, the diversity of flora has nearly doubled from 70 species in 1995 to 130 in 2000. According to an assessment made by a un team, the Chitripani and Bhagawatisthan leasehold sites have recorded an unprecedented rise in income level from forest produce extracted from regenerating forests. The quantities of grass and foliage harvested during 1999 have increased by about 60 per cent in terms of yield. 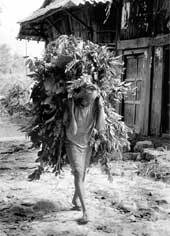 The women of the region have stood to gain substantially from this development: their daily trudge to the forests and the energy expended to collect fuel wood and fodder take two and a half hours less than before. The most visible change that the programme has spawned is reflected in the density of forests. "The leasehold forest becomes more structured, multi-layered and develops a good ground cover, increasing from 32 per cent in tracts that have been recently handed over to 78 per cent in 6-7 year-old lands. This has led to a greater availability of fodder and fuel wood also," observes the un report. The abundance of fodder has encouraged villagers to take up livestock rearing. During a survey in Makwanpur, it was found that six of the eight households that did not have livestock earlier now possessed some type of farm animals. Even the poorest of households are reported to have acquired goats. "Impressed with the positive impact the programme has had on livelihood security, the country's policymakers are promoting it as a major poverty alleviation measure," says Jamuna K Tamrakar, deputy director general of the fd's planning division. On the food security front, too, there is cause for cheer. It has registered an eight per cent increase in leasehold forest areas, states a survey conducted between 1996-99. The water table in these regions has risen due to the restoration of ecological balance. The astonishing success story scripted by the poor in Nepal's forests after an uphill struggle runs the risk of coming to an abrupt end, given the liberal doses of officialdom to which the scheme is being subjected. Currently it takes more than two years to get a lease certificate for forest tracts. At this rate, the government estimates that it will take around 40 years for the process to be completed. Only 10 per cent of the total earmarked degraded forests in the first 10 project districts has been leased out to beneficiaries. Official data reveals that at least 60,000 ha of potential leasehold forestland is still available in these districts. This would be sufficient for at least 80,000 poor families. There is also the danger that the leasehold forestry programme may go the cfm way. The progress made by the latter spurred the authorities to wrest control of the woodlands (see box: Trouble brewing in Terai ). Yet another impediment is that unlike cfm, all decisions pertaining to leasehold forestry are made at the highest level in the environment and soil conservation ministry. Then there is the participative management aspect. In cfm, it is the local forest officials who interact with communities. However, the ministry chalks out the operational plans in leasehold forestry and the communities merely reach a consensus on them. "It is definitely a stumbling block," admits Bhatta. To be sure, the fd has recently sought some legislative changes in the Forest Act to decentralise the procedures. But the fact is that leasehold forestry doesn't get as much legal support as cfm does. The only mention it finds in Nepal's Forest Act is in the commercial context. As the beneficiary groups are not registered with the fd, they are treated like other cooperatives and technically can be kept out of leased forests. Unfortunately, for all the positive results that the leasehold forestry programme has shown, it still seems to be treated like a poor relation of the cfm.